Now there’s no need to upload your photos separately on Facebook after you’ve saved them on Flickr. 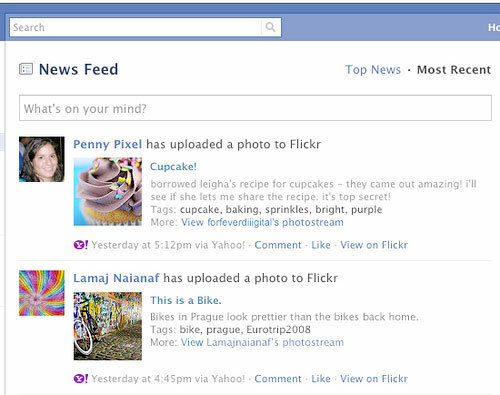 Flickr has just announced the new feature which allows users to connect their Flickr and Facebook accounts .Opting for this feature will automatically send an update to a users’ Facebook account every time a photo or video is uploaded on their Flickr account. You can go to www.flickr.com/account?tab=extend and click “Connect” to activate this feature which ensures users’ privacy by sharing only those photos and videos on Facebook which are uploaded as public on Flickr. This feature is a facility brought to users as an after math of the hookup between Yahoo and Facebook a few days earlier. Yahoo had promise to bring a more integrated web experience between the two giants and to sync its services with the social networking site as much as possible. That Was Fast! Facebook Announces New Privacy Features! Previous post: Google’s Custom Background Image, Want to Turn it Off? Next post: Internet In 2020, All in the Cloud?